Tomorrow night is our Dress Rehearsal for Absurd Person Singular. 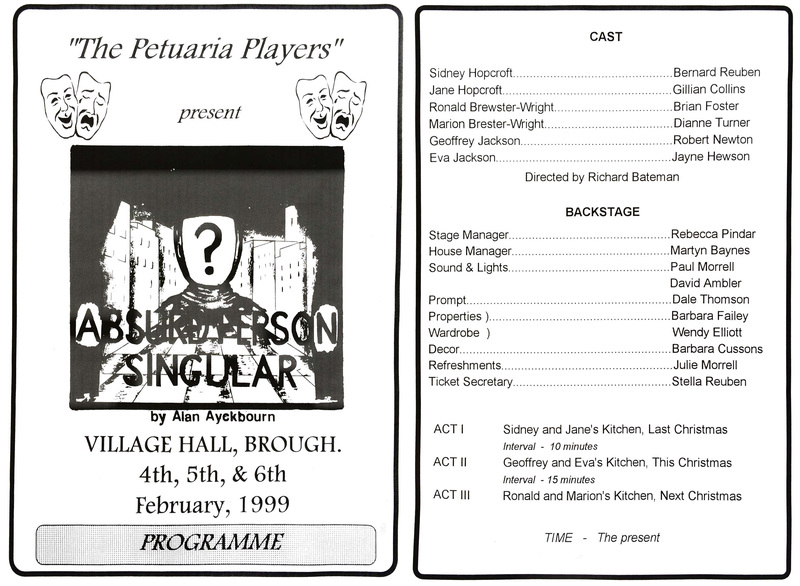 But did you know we first performed this play back in 1999? This play was a favourite of Bernard Reuben, a long serving member of the group who died almost a year ago. We selected this play as a tribute to him and some of our actors are resuming their original roles with Rob Newton and Jayne Hewson as the Jacksons and Gill Collins as Jane Hopcroft. Steve Howland takes Bernard’s original part of Sidney and the Brewster-Wrights are this time performed by Janet Drewery and Wyn Price. Richard Bateman, as in 1999, is producing and directing.